﻿ Best Price on Hacienda Puerta del Cielo Eco Lodge & Spa in Masaya + Reviews! 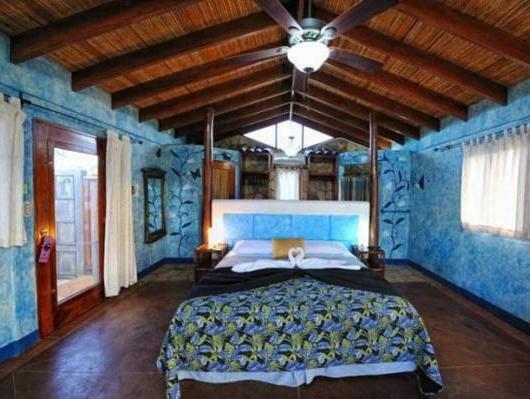 This impressive property is on a hilltop just outside the Masaya Volcano National Park. It offers an outdoor pool, hot tub and stylish rooms, all with amazing views. In thatched buildings, the rooms at Hacienda Puerta del Cielo Eco Lodge & Spa feature a private patio with great views of the national park. Each one comes furnished with a private bathroom with a hairdryer. The Hacienda’s spa includes a Finnish-style sauna and offers a range of massage treatments. There are also various terraces where guests can relax in a hammock while admiring the views. The hotel’s restaurant serves traditional Nicaraguan food. There is also a bar where guests can grab a snack or a drink. Puerta del Cielo is a 30 minute drive from the town of Masaya. Guests can drive to Managua and its airport in just under an hour. Please let Hacienda Puerta del Cielo Eco Lodge & Spa know an expected arrival time at least 72 hours in advance. Please use the Special Requests box when booking or contact the property. Please note that alcoholic drinks are not included in all-inclusive rates.